Propane inventories (including propylene produced at refineries) in the Midwest United States had been lower than the previous five-year average for much of 2018, but in recent weeks, net additions to inventories increased Midwest propane to levels higher than the previous five-year average. 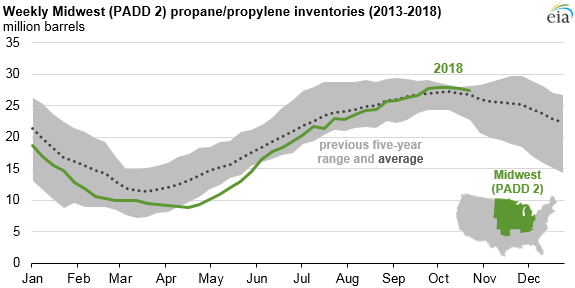 For the week ending October 19, propane inventories in the Midwest, or Petroleum Administration for Defense District (PADD) 2, were 27.8 million barrels, or 792,000 barrels higher than the previous five-year average. Note: Inventories of propane/propylene may include consumer grade propane, propylene, and any propane and propylene held in mixes. 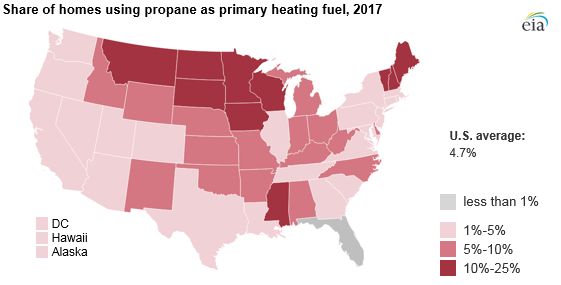 In EIA’s most recent Winter Fuels Outlook, winter heating expenditures for Midwest households using propane as their primary heating source are expected to decline because, unlike the rest of the country, the Midwest is expected to have warmer weather this winter relative to the 2017–2018 heating season, according to forecasts from the National Oceanic and Atmospheric Administration.